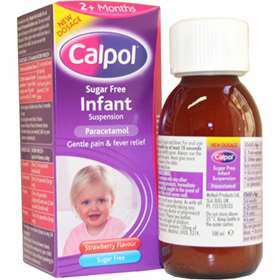 Calpol Sugar Free Infant Suspension - Contains Paracetamol - Pain and Fever Relief. Each 5ml spoonful contains 120mg Paracetamol. For babies over 2 months up to 6 years. Also available in a larger 200ml bottle. Calpol Sugar Free Infant Suspension can be used to provide relief from fevers (raised temperature), teething, post-immunisation fever, headaches, earache, cold and flu symptoms, sore throat and mild aches and pains. Shake the bottle for at least 10 seconds before use and do not exceed stated dose listed below. 1. Post vaccination fever 2.5ml (small end of spoon) If necessary, after 4-6 hours, give a second 2.5ml dose. 2. Other causes of pain and fever - if your baby weighs over 4kg and was born after 37 weeks. 2.5ml (small end of spoon) If necessary, after 4-6 hours, give a second 2.5ml dose. HOW MUCH? - up to 4 times a day. Do not give this medicine to your child for more than 3 days without speaking to a doctor or pharmacist. Do not give your child this medicine if they have ever had a reaction to any of the ingredients, if they are taking anything else with paracetamol in it, if they were born before 37 weeks or if they weigh less than 4kg. Keep bottle cap securely engaged at all times. Consult your doctor before use if your child is taking any other medicines. This product is suitable for infants from 2 months to 6 years. Always use the spoon provided to measure. Each 5ml contains: 120mg paracetamol. Also contains: Maltitol, E420, E214, E216, E218 and E122.